What an odd little episode this was. The thing I really liked about it was that both Thomas and Robert, two truly awful characters this season, were able to show that maybe, just maybe, there is more to them than we have seen in a while. Poor Andy. He comes into the Grantham house for only a few days and manages to lose his life savings in a gambling den called, of all things, the Velvet Violin. Thomas, whom I would expect to take a certain amount of glee in all this, does just the opposite. He figures out what is going on, wins Andy’s money back for him, and manages to turn the tables on Denker. Watching Thomas help a younger man was heartwarming. Perhaps the fact that Baxter has been so kind to him is beginning to affect him. I like this side of Thomas much better than the nastier one. Robert may be many unpleasant things, but he is no fool. It didn’t take him long to figure out the truth about Marigold’s parentage; although, if we’re being completely honest, the way Edith is acting, I’m surprised Mary and Tom haven’t picked up on it as well. But, Robert is the one who sussed out the truth. I was pleasantly surprised by his reaction. I had expected a lot of blustering and shouting. Instead, he seemed oddly content to be in on a secret -- for once. Perhaps he is beginning to enjoy the role of grandfather. His other truly remarkable act was erecting a stone for Mrs. Patmore’s nephew. The kindness and the compassion of this act are startling in a man who is usually so self-absorbed and so blind to what others are feeling. Similarly, his admission of why he is selling the painting was very sweet. Please, oh please, let this man be the one we watch as the series draws to a close. Other than these two, the episode felt oddly flat. All the stories circled around Rose and Atticus’s wedding, but I just couldn’t invest in them. All the silly stuff about Rose’s mother trying to ruin the wedding would have been so much more if we knew Susan better or we were completely invested in Rose and Atticus. Setting up your future son-in-law to be photographed with another woman is bizarre. I couldn’t take it all very seriously. Neither did I care that Lord Sinderby was so upset by his only son marrying outside the faith. I liked Lady Sinderby, and I liked the way she had Rose’s back, but we don’t know these people at all. The sad fact is that I realized half-way through the episode that I didn’t care one way or the other if Rose and Atticus got married. I am a romantic at heart and I love a happy ending, but this love story was too quick and it was too easy. Because any odds they had to overcome were too easily surmounted, the whole plot was just blah. The two older women are dealing with affairs of the heart as well. Isobel is still conflicted about whether to marry Lord Merton and Lady Violet receives a most unexpected proposal. I did enjoy the scene where Kuragin proposed. Something tells me these two truly loved each other back in the day. Lady Violet, however, has an moral streak that just won’t quit. I can’t imagine her involving herself with a man whose wife, as far as anyone knows, is still alive. Now that the idea has popped into my head, I keep watching the show for hints of foreshadowing of Tom and Mary being the endgame couple. Perhaps I am reading too much into what I am seeing, but Fellowes seems to be dropping some broad hints. Mary’s distress at the idea of Tom going to Boston and the smile they share when Mabel talks about country weddings made me think. I’m not completely sure how I feel about them as a couple. In many ways, it would make sense. But, for some reason, I’m not convinced they are a good match. I guess I’ll have to wait and see. I was vaguely disappointed in this episode. It wasn’t bad; it wasn’t dull; it wasn’t much of anything. Some wonderful moments sprinkled through a story that I just couldn’t bring myself to care about. It is, however, those wonderful moments that keep me coming back. — Anna has been arrested? Really? I can’t even bring myself to write about the absurdity of this “twist.” And, it turns out that Anna is not the only woman Green raped. Let’s see -- could there be other husbands, brothers, fathers out there set on revenge? — Thanks to my eagle-eyed reader Bob, we had another Alistair Bruce sighting (which I missed until Bob pointed it out to me). He is the general standing next to Robert at the unveiling ceremony. — I must admit that the unveiling brought a tear to my eye. It is clear that everyone there had been affected by the war in some way. The other thing that I realized is that I was in a bit of mourning myself. The second season of this show, the one that takes place during the war, is proving to be the best of the lot. — I’m not sure, but I think we’ve lost Isis. It would have been nice to have a bit more on that. — Finally, a small bit of history. The “Amritsar incident” was, perhaps, the low point of the British occupation of India. In April, 1919, two supporters of Gandhi were arrested in the town. The local population came out in support of them and were fired upon by British soldiers. Three days later, however, thousands of people had gathered in a temple for a traditional festival. The senior British officer at the time ordered the exits blocked and 90 soldiers fired point blank into the crowd. It went on for about ten minutes and, when all was said and done, over 1,000 died. And, so say all of us. For the first time ever, the best line went to someone other than Lady Violet. I had much the same reaction to this one, Chris -- delight that Robert and Thomas were being so nice for a change, and mostly meh about the wedding. I'm pretty sure they said Isis was about to be put down at the end of the last episode, but I could be remembering incorrectly. 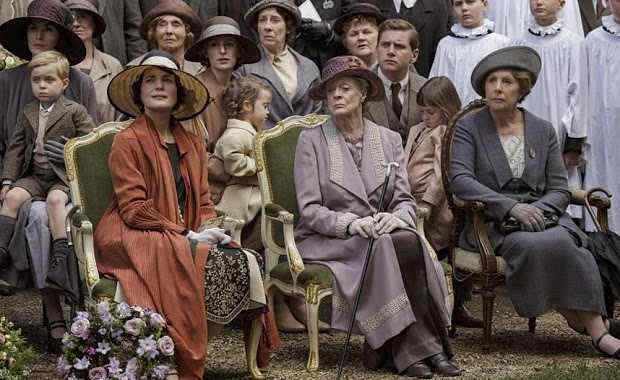 Isis made a miraculous recovery and is now happily running around the grounds of Downton. Don't fight me on this. I'm with sunbunny. Although we know that Isis was very sick and sleeping in Robert and Cora's bed at the end of the last episode, we were never specifically told that she died. In my mind, therefore, she is somewhere on the grounds chasing rabbits. Thanks for the review Chris. Now I understand why this episode had trouble keeping my attention although I do like Rose and Atticus as a couple and weddings are good just for the fluff of it all. I never liked Tom and Sybil. I felt they had no chemistry. I did wonder if the writers were going in the direction of Tom and Mary or even Tom and Edith. I really want Edith to find happiness.